We have seen instances in the past of resourceful developers throwing together various pieces of work and technologies to create clever ways of controlling lighting levels at home or office as well as creating make-shift home automation systems that may not have the same power as a premium system, but still gets the job done. The SiriProxy-Hue project is yet another example of how community driven projects can interact with Apple’s own software and hardware to create a usable system for the average user. The Philips hue was released not that long ago as an Apple Store exclusive, and basically gave users a relatively simple way of setting up and controlling lighting systems in their homes that are controlled through a dedicated, native iOS app. The basis of the system is that it is extremely simple to install using the included wireless bridge, with the included light bulbs fitting seamlessly into existing standard sockets in the home. 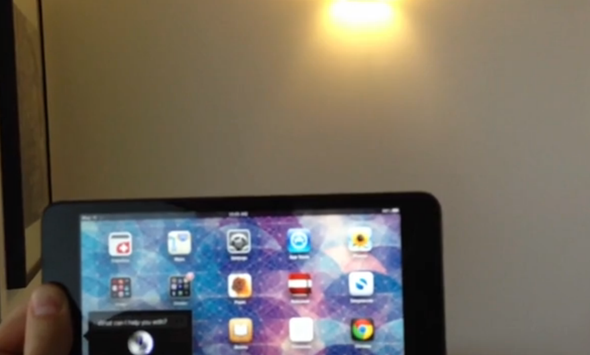 Thanks to a downloadable project from Brandon Evans and some existing work on the SiriProxy project, a method of controlling the Philips hue using the Siri digital assistant has been demonstrated. The SiriProxy-Hue project is basically a SiriProxy plugin that requires some initial user setup before allowing the hue lighting system to be controlled by giving simple audible commands to Siri on an iPhone, iPod touch or iPad. A number of available commands are available at present, such as telling the system to turn off all of the lights, turn on lights in individual rooms by specifying the room name or actually providing a lighting level expressed as a percentage. The notes on the GitHub project page also seem to suggest the Evans is working on implementing the inclusion of color changing commands for each attached bulb as well as giving the order to change the lighting system to a pre-determined scene. Both would be extremely welcome to anyone who intends to use this system. Using the project does require some initial setup and therefore for development knowledge, but if you can get past that small hurdle then it looks like a great way to control the Phillips hue using Siri. Siri may not have won the hearts of those making simple business related search requests but she seems to excel in organizing the home pretty well.